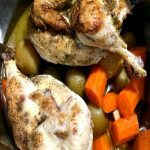 This Instant Pot Split Chicken is made with a whole split chicken, baby potatoes, carrots, and garlic in a seasoned broth, and is quick and easy to make. With Valentine’s Day being on a work and school day this year, we are going the nontraditional route for dinner. I really, really mean it. Our daughter always gets a Happy Meal for a good report card, and since report card day was yesterday but we were busy, it looks like we will be having McDonald’s for Valentine’s Day. How romantic, right? This is what my life has become. If you are like me and have no chance of a really romantic dinner, Instant Pot Split Chicken is quick and easy to make. 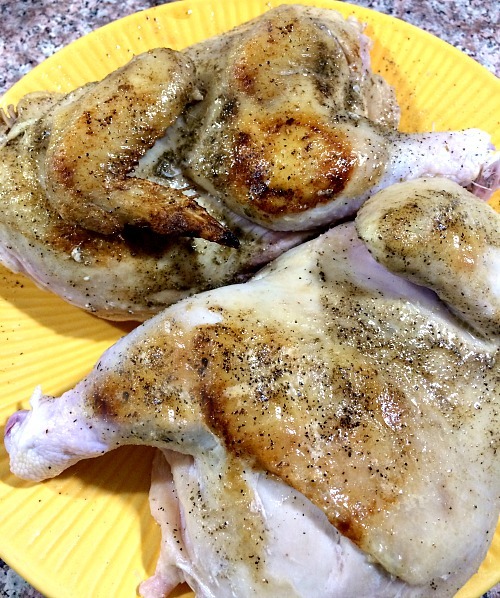 Here is how to make split chicken in the Instant Pot. First of all, I am not going to tell you how to split a whole chicken, I don’t even know how to. I bought mine already split. You can have your store butcher split a chicken for you, do it yourself, or make a whole chicken in the Instant Pot. 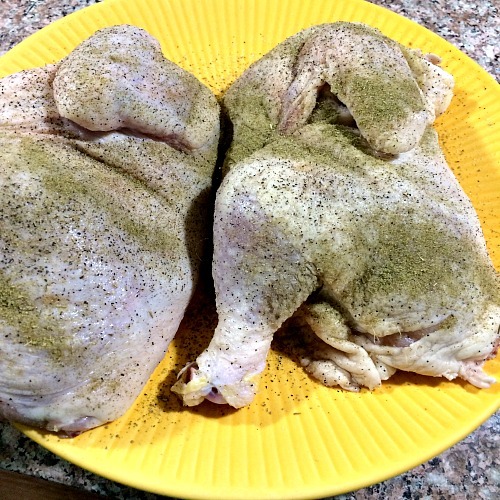 Season the chicken, patted dry, with salt, pepper, and poultry seasoning. Using the saute function on the Instant Pot, melt butter. Add both pieces of the chicken, breast side down and cook for about 5 minutes until browned. If your chicken is larger than three pounds you will have to do this in two batches. Remove the chicken from the Instant Pot and set aside. Add two cups of chicken broth, one pound of baby potatoes ( I used Yukon gold), three large carrots that have been chopped, and four cloves of garlic. Place the chicken back in the Instant Pot, seal the lids, press Manuel and set for 30 minutes. It might take up to 20 minutes for the Instant Pot to come to pressure. 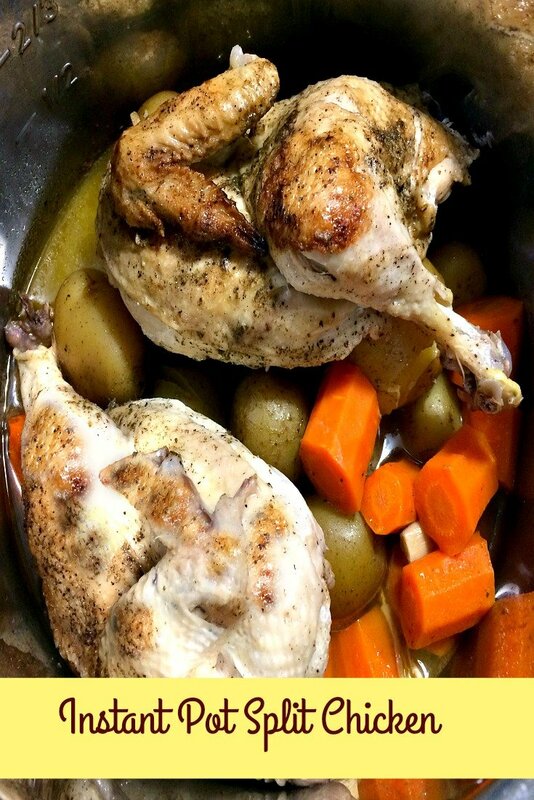 The chicken comes out fall off the bone, the potatoes so tender they could easily be mashed, and the carrots tender and flavorful. The skin doesn’t stay crispy, however. Season the chicken, patted dry, liberally with salt, pepper, and poultry seasoning. Using the saute function on the Instant Pot, melt butter. Add both pieces of the chicken, breast side down and cook for about 5 minutes until browned. If your chicken is larger than three pounds you will have to do this in two batches. Remove the chicken from the Instant Pot and set aside. Add two cups of chicken broth, one pound of baby potatoes that have been scrubbed clean ( I used Yukon gold), three large carrots that have been chopped, and four cloves of garlic. Place the chicken back in the Instant Pot, seal the lids, press Manuel and set for 30 minutes. It might take up to 20 minutes for the Instant Pot to come to pressure. The chicken should be falling off the bone after cooking. Ensure that it has reached 180 degrees with a meat thermometer before serving. Save the strained liquid from the bottom of the pot, skimming the fat off before using or freezing. Use as chicken stock in any recipe.